noon Mountain Time on Monday, January 22: Registration Deadline: All presenters, performers, panelists, collaborative pianists, & composers whose works will be performed on the program must register to confirm their participation. Thursday, March 15: Mail-in Registrations must be postmarked by this date. noon Mountain Time on Thursday, March 15: Online registration closes. Participants must register on site after this date. noon Mountain Time on Thursday, March 15: Cancellations received before noon Mountain Time will be entitled to a full refund, less a $10 handling & processing charge. Registrations cancelled after 12:01 p.m. Mountain Time will not be entitled to a refund. Registrations are non-transferable. How to Reserve: Call the hotel and reference the CMS conference. Deadline: Reservations must be made by Thursday, March 8, 2018. How to Reserve: Call Marriott Reservations at 1 (800) 321-2211 or (614) 436-7070 and identify yourself as part of the Otterbein University Music Department Block group staying at the Courtyard Columbus Worthington. Deadline: Reservations must be made on or before Thursday, March 15, 2018. Please contact Dr. Nick Ross at or 614-823-1020 if you encounter difficulties with your room reservation. right before a sharp curve. On this map, Battelle Fine Arts Center is building 14.
there is a short walk involved to get to our building. The other option is to park on surrounding streets or in Uptown Westerville. Parking limit in some places is four hours, but often parking is unlimited. Lunch on Saturday will take place at the Campus Center, #44 on the map. The music of composer Marilyn Shrude is characterized by its warmth and lyricism, rich timbre, multi-layered constructions, and complex blend of tonality and atonality. The result is a bright, shimmering and delicately wrought sound world that is at once both powerful and fragile (Natvig – New Grove). Shrude earned degrees from Alverno College and Northwestern University, and has served on the faculty of Bowling Green State University since 1977. Among her more prestigious honors are those from the Guggenheim Foundation, American Academy of Arts and Letters, Rockefeller Foundation, Chamber Music America/ASCAP, Meet the Composer, Sorel Foundation (Medallion Winner for Choral Music 2011), and the National Endowment for the Arts. She was the first woman to receive the Kennedy Center Friedheim Award for Orchestral Music and the Cleveland Arts Prize for Music. In 2014 she was given BGSU’s Lifetime Achievement Award. 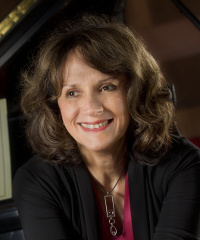 Active as a composer, pianist, teacher, and contemporary music advocate, Shrude has consistently promoted American music through her many years as founder and director of the MidAmerican Center for Contemporary Music (1987-99), as chair of the Department of Musicology/Composition/Theory at BGSU (1998-2011) and as coordinator of the doctoral program in contemporary music (2006-present). Together with saxophonist, John Sampen, she has premiered, recorded and presented hundreds of works by living composers both in the United States and abroad.